This project is one of my favorites and has been a go-to baby gift for a while now. Start with a full size bath towel. Cut a square as large as you can and round the corners. I usually trace the edge of a bowl to make sure they're the same. From the scraps, cut a hood shape by tracing one of your corners. Cut any ears, spots, noses, or anything else you'll need (depending on how you're decorating your towel) from towel and fabric scraps. If you're making ears I recomend using one layer of towel and one of cotton. Attatch your face shapes using heat n' bond lite (iron-on adheasive) and sew around the edges. To make the ears, put the right sides of your cotton and towel shapes together. Sew around all edges BUT the bottom. Turn right side out. Lay the ears on the hood and pin in place. Align the hood with one corner of the towel (right sides together). The ears will be sandwiched between. 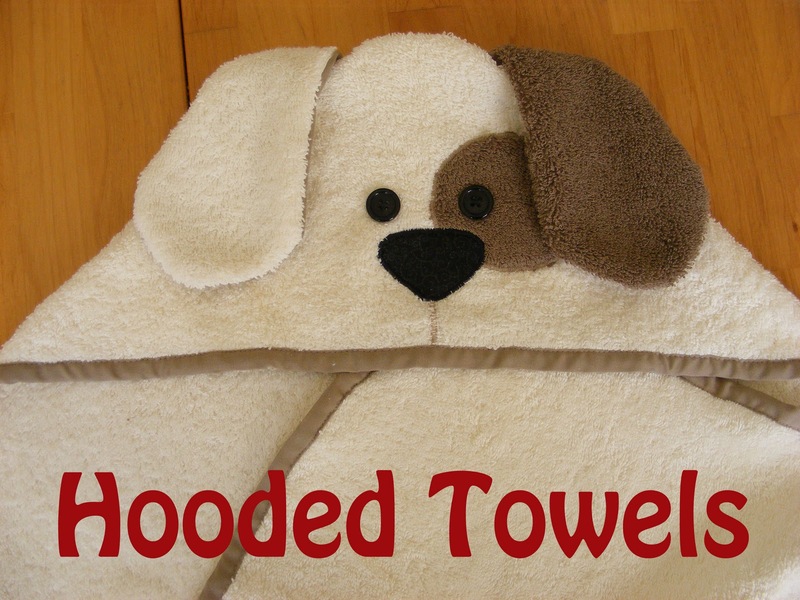 Sew the hood to the towel by sewing along the top hood edge. (I usually sew over this a couple times to make it extra secure). Sew the trim (extra-wide double-fold bias tape) around the towels raw edges. Add any finishing touches- like these button eyes. Here's a frog version. You can see the shape of the towel and how the trim goes around in this picture. Sometimes I roll them up and tie with the extra bias tape. Enjoy your new hooded towel! Do you want the pattern? I have the dog, frog, and many, many more animals all designed and waiting for you to create! AHHHHHHHHH!!!! I LOVE THEM! What a great tutorial. Great job! I need to make these for my kids. Our store-bought versions have seen better days! Hope to have you link this up on Friday!!! Great instructions. I definitely want to make some of these. Thanks for sharing! OH my gosh! These are so adorable. Do you think that this would be too hard for a beginner sewer? Absolutely adorable! I am so in love with these towels and very excited that I finally get to make one for my own child. Yours look so professional! so adorable. I want to make one for myself! That puppy hooded towel is positively darling. This project will be featured at Creative Juice Thursday next week! Love these, deffiantly going to have to try I dont think mine will be that cute! No. Way. That is adorable! So stinkin' cute! Thanks for the tutorial! These are just so cute! I would love to give this as a gift. I am going to be putting this on my list. I can say that puppy towel is WELL loved here :) This is an awesome tutorial! Thank you for sharing!!! I was just thinking that its time for her towels for my son! I love these! I can't wait to make one. Thank you so much! Feature Alert! Feature Alert! This was featured today over at Today's Top 20! Come Check it out! I love these towels! Thank you so much for the tutorial! I have a little one on the way, so I will definitely be whipping some of these up for him in the near future!